We made it through the first full week after winter break!!!! YAY! And you know what we have planned for this weekend??? Nothing... Zero.... Nada! Now I'm sure we will find something to fill up our days, but I like knowing I am not scheduled to be anywhere at any specific time! This is an oldie but goodie nailpolish color......OPI 's Not so Bora-Bora-ing Pink. I needed a break from the dark colors of fall & reds from the holidays. I found this is my basket full of colors and thought it was a perfect color for January! You see those bracelets in that pic? Those are a favorite this week too! I got three new colors for Christmas and just love them! They are from Aid Through Trade and help to employ over 200 female artisans in Nepal. Check them out here... super cute and helps a great organization. Local friend... you can get yours at Research & Design! And speaking of Christmas gifts... these Sorel boots are AMAZING. We have had some seriously cold and snowy weather the past week and these have kept my feet warm, dry and bonus...super comfy! They are really the best ever winter boots! The house seemed a little plain after all the Christmas decor came down, so I added a couple pops of Valentine's this week. It know its early, but it makes me happy! Frozen yogurt date on a frozen Monday night with my crew! Paul went skiing with some friends after work, so the kids and I ventured out in the freezing cold for some frozen yumminess! Luke should really just skip the yogurt and put gummies in his cup. Ella and I were done with ours and he was still eating through his first layer of gummies! The first week of our meal planning on the blog. If you missed it, you can catch up here. 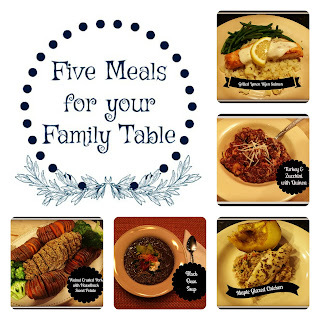 We will be sharing 5 meals for your family table each week. Healthy, quick, meal ideas that can help take the guess work out of "What's for dinner?". I have been planning out weeks of meals and testing recipes & ideas! I can't wait to share each week with you! So that's about it for our week! Looking forward to our weekend of nothing... which will probably fill up with something! We are thinking ice skating and going to see Sing! Enjoy your weekend friends & stay warm! See you Monday with a new menu... there's always room for one more at our family table. Love the pretty bracelets for a good cause! Does every family have the normal paced eater and the slow poke? My daughter's resolution is to eat faster since she's the first to start and last to finish! Happy weekend! Ha..yes we all have different eating paces for sure!! Love the bracelets too! What a great cause! How do you find these amazing things? And can you tell Santa that I could use some Sorel's? Oh wait. Christmas is over. :( love this!!!! Keep up the great work'!! Aww..thanks Amy! You need to venture over to Research & Design...they have such fabulous things! And you get 30% off one thing during your birthday month! It is never too cold for froyo!! My son would have done the same thing with the gummies. Hope you're having a great weekend so far! I do agree! And boys with those gummies! He loves all things gummmie! !